Operating System: Windows 98/ME/2000/XP/2003/Vista/7 of both 32 and 64-bit. Support PDF format of version up to 1.8. No need for a third-party PDF editing application. Edit and append PDF descriptions including tile, subject, author, keywords, created time, modified time, creator and producer. Able to set and append custom PDF description. 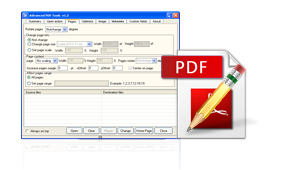 Set PDF OpenAction such as, which page to display, hide menu bar or not, initial page magnification, position of PDF viewer window on the screen, and so on. Set size of PDF page and page content. Able to rescale and rotate PDF page. Optimize PDF by removing metadata, Java script, thumbnails, etc. Option to enable PDF fast web view. Recompress images of PDF to color (Flate, JPEG or JPEG200), gray (Flate or JPEG) or monochrome (Flate or CCITT G4) images. 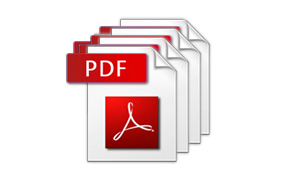 Export source XML metadata from PDF. Import XML metadata to PDF. Support batch process that can edit multiple PDF documents by one click. Command line operation - Advanced PDF Tools has a command line version which is much useful for manual control and script calling.